Last week, my boss delivered exciting news. He asked me to write scripts for a series of TV commercials and radio ads that will be airing during some well-known shows, like Good Morning, America and The Today Show. Not exactly prime time, but not too shabby, either. Viewers could potentially be watching Al Roker one moment, and my television spot the next. The bad news? These commercials will be airing in Bismarck, North Dakota. No matter how badly I’m tempted to call Bismarck “the Hollywood of the Great Plains,” that’s a real stretch and a whole bunch of wishful thinking, at best. Still, the opportunity to write commercials is pretty damn cool, and a dream of mine. You can only write about sinus infections so many times before burning out, you know? I majored in Advertising in college and have taken courses in this stuff, but decided to pursue a different career when I graduated, so it’s taken me 22 years to actually put some of that knowledge to use. What a long, strange journey it has been. In typical Mark fashion, I’ve let this assignment go to my head. I’m worrying about finding the perfect key grip, for example. I want to make sure the director has good qualifications. I even considered demanding a craft table for my cubicle, with a bowl full of nothing but blue and orange M&Ms, but thought that might be crossing the line just a bit. And, I’ve apparently forgotten that these commercials will be airing in North Dakota. “Who’s Leonard Nimoy?” she responded. “Who’s Leonard Nimoy?” he asked. CUE STAR TREK THEME MUSIC. Genius, right? Sadly, Nick informed me their budget precluded hiring any famous Hollywood actors. I had a backup script where ordinary North Dakotans were attending ComicCon and wearing fake Spock ears, but then I realized, North Dakotans don’t attend ComicCon. Roping events and steer auctions, yes. But not pop culture festivals. So I settled on a different angle that’s pretty corny (literally): two women are shopping in a grocery store and picking out ears of corn to place in their carts. One of them says “You won’t believe your ears,” they both notice all the corn in their shopping carts, and burst out laughing. I figure that’ll play well to the Midwestern mentality. North Dakotans think corn is funny, right? It’s too bad these commercials aren’t airing in Fargo. I had a great idea involving a wood chipper and funny accents, but if they couldn’t afford Leonard Nimoy, I doubt they’d be able to hire Frances McDormand and Steve Buscemi. The perfect spokesman for a hearing clinic, right? So, this may not be the big time, but it’s a nice change of pace and will look great on my resume. In other news, we’re two days away from the big work symposium – our annual conference in which I get to give a presentation on social media success. After a couple of practice runs I’m not as nervous about that as I had been, but it’s still going to be a lot of work over the course of three days, and I’ll have to give up a good portion of my weekend. In some small way I think there might even be moments where it approaches fun, or at least as much fun as you can have spending all day and half the night in the company of coworkers who don’t even know who the hell Leonard Nimoy is. Once the symposium is over, I’ll be able to relax. I’ve been so focused on both the wedding and the conference for months now that I’ve barely been able to breathe. Come Sunday I’ll be feeling much better, I’m sure, and will actually be able to look forward to the rest of the year. Once the symposium starts I won’t have time for the blog until next week, so I’m wishing y’all a great weekend in advance. For markets like Bismark, all of upper mid west and great west I would try within my ability to mimic the mood and style of Garrison Keillor. Ahh, yes. A Prairie Home Companion and all that jazz. I did see on their schedule that the ads will also be running during the U.S. Farm Report on Saturdays, so this makes perfect sense to me. Every time I hear anything about North Dakota all I can think of is what people used to say about being stationed at Minot Air Force Base. It’s true, you could freeze your ears off in North Dakota. Good luck with the presentation and the commercials. LOL – that’s great. Having lived for 3 years in North Dakota’s neighbor to the south – that would be South Dakota – I know very well that freezin’ is part of the game! A HUGE congrats on the commercials, Mark! And okay, I can’t believe no one has ever heard of Leonard Nimoy!?! I mean, I was never a big Star Trek fan, but I at least know who he is. The best to you on your presentation. You’re going to be faaaaaaaabulous, I know! Have a super weekend and we’ll see ya next week! 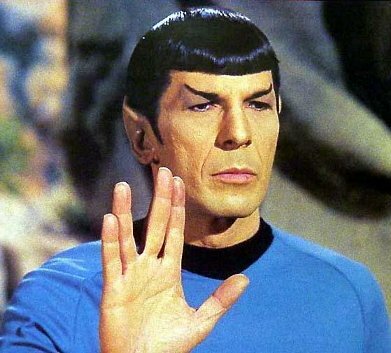 Maybe I should have suggested Zachary Quinto instead (the “new” Spock). Sheesh. I wonder if they’ve heard of William Shatner?! These sound like wonderful opportunities, Mark, and I love your ideas. Hell, I even know who Leonard Nimoy is! Whew. At least somebody else is pop-culture savvy! Thanks, Kathy! What the hay? You’re not going to post anything for a whole week? I’m going to up to my ears with boredom. This will be the longest I’ve gone without posting in years…literally! Up to your ears, eh? I see what you did there…clever. I hear ya on that! Hehe…I am pretty clever!! *I’m going to BE up…BE…sheesh!! Congratulations! Wishing you much success with your upcoming commercials! It is fantastic! Thanks, D.! Fingers crossed myself…. I will keep my toes too! I fail to see how a woodchipper would make me want to go to a hearing clinic, Mark. I take it that’s your accomplice… He’s funny looking. Mark, Marsha Lee from TC History Gal is in Portland, Oregon till Monday. Do you follow her? http://tchistorygal.com/2013/09/22/the-accidental-vacation-chapter-six/ She would like to meet you if you have time. I know you have your in-laws this weekend, but I understand Portland, OR is quite close to you? I don’t follow her, Lynda. Is she reading my blog? Nice of her to want to meet. This past weekend was much too busy, unfortunately – and now it’s back to work. Portland IS close to me, though – just 10 minutes away!